Flight of the Conchords: Is a Movie Really in the Works? Will there be a movie based on the Flight of the Conchords TV show? It’s really hard to say, especially if you listen to the people should know the answer. At the recent premiere of The Muppets, star/co-creator Bret McKenzie offhandedly said, “We’re gonna try and do a movie… We just need a story.” McKenzie served as music supervisor on The Muppets and co-created Conchords with James Bobin (the movie’s director) and Jermaine Clement. But comedian Rhys Darby, who played band manager Murray Hewitt on the Conchords TV series, says that’s not true. 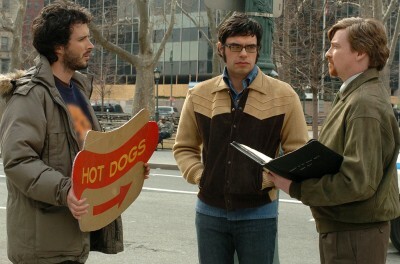 Flight of the Conchords came to an end in 2009 after two seasons and 22 episodes, despite the fact that HBO executives wanted a third season. Prior to the announcement, Clement had said that writing the episodes and the songs was just too time consuming. What do you think? Will there be a follow up to the TV series? Do you think HBO will be involved or is the team doing it on their own?